Following that magnificent colored creature, I glided through the water without breathing air. It didn’t seem possible…it was not possible!…but somehow it seemed I was equipped with diver’s fins and a face mask, a regulator and a tank of air on my back. But I was without any of those, even without clothes or a suit but still not naked in any marked way, just me floating through the water following your everyday extra large weeded sea dragon. I did permit myself a wheeeeeee! because it was quite the rush to be, well, a fish. At first it was just green water that rushed by. Green water was a difference for me, as I was used to crystal clear turquoise water and then deeper blue water. One would not think that underwater colors when in a clear liquid would be apparent. But the colors are there, mainly as one looks up at the sky. I don’t really understand the refraction that causes the color shifts…blue sky above should cause blue water below…but here it was blue above with green underneath. I’m certain a scientist could explain it. But when you suddenly find yourself a fish, light refraction values pale in comparison. The weedy sea dragon and I sped along. The water got deeper and above was bluer. I kept looking for sharks, out of habit I suppose, and still had not made acquaintance. A sandy bottom was evident and I don’t think we were any more than 20 or 30 feet below the surface; since we were in Australia I was willing to convert, even, to 10 meters or so. The corals surrounding us were stunning. There were golden coral antlers and purple sea fans, lavender brain statues and delicate floating soft polyps. This world was so alive. Multiple schools of fish joined us, marching black and white on yellow sargent majors, precision surgeon fish, the occasional ray that flapped past in disdain. Up ahead I saw a sandy bottom surrounded by towering coral. Ubiquitous parrotfish were feeding on the coral as always, munching those hard coral bits and pooping sand that formed bottoms such as this and ultimately, beaches. But these parrotfish, these were bright turquoise with a line of bright scarlet slashing their bodies. They were soldiers and they formed a circle around the interior of the circular reef. 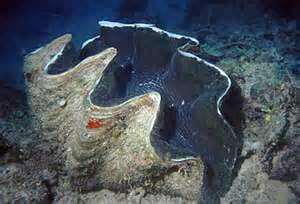 In the middle, well not in the exact middle but more to the west of the circle, I saw a giant clam. It was not spectacular except in size. The clam was at least six feet tall and maybe ten feet wide. It was drab gray/black, donned in green algae. The interior, such as I could see, was dark and maybe a midnight ocean blue. As my weeded friend approached, the clam opened. The opening was pink and startlingly light. It appeared a pearl of some sort emitted an effervescence from within. The clam’s lining pulsated and I was transfixed. The soldier parrotfish tightened their circle around me as the sea dragon nosed his way into the clam, and I found myself pushed downward by a turquoise sand-emitting madding crowd into the pulsating unknown abyss.